Fundraiser by USF SOAR : SOAR's Quest to the Karman Line! SOAR's Quest to the Karman Line! The Society of Aeronautics and Rocketry (SOAR) at USF is proud to have submitted an application to be a part of the Base 11 Space Challenge. This is a national competition challenging college rocketry teams to send a single stage, liquid-fueled rocket to an altitude of 62 miles! SOAR is incredibly ambitious and excited to start working on a project of this caliber. It is truly groundbreaking for a collegiate team to have not only a working liquid propellant engine, but to launch it in a rocket and recover it safely. A project like this is possible through the dedication and tireless efforts of our team members, and support from you. We won't be officially accepted into the competition unless we have proof of insurance. This insurance, which we must supply on our own, will protect the students and volunteers that work on this project. The insurance cannot be funded by amateur rocketry organizations, such as Tripoli Rocketry Association or National Association of Rocketry, because of the large scale of the Base 11 Space Challenge and the dangers and challenges that come with it. We are having difficulty funding this insurance, thus the money you donate will go to paying for this necessity. The previous deadline for the insurance is November 1st, but Base 11 was gracious enough to extend the deadline for us! We have until the end of 2018 to provide the proof of insurance. This may take some weeks to process, so let's aim to have the funds in by December 1st. Any amount is much appreciated by all of our SOAR members, faculty and mentors. This project is very important, as it provides us with the skills and experience needed to be successful for this project and for our future careers. A challenge like this comes once in a lifetime, and possibly once in a generation. Help us be a part of this challenge, and allow us this extraordinary opportunity. Great news! 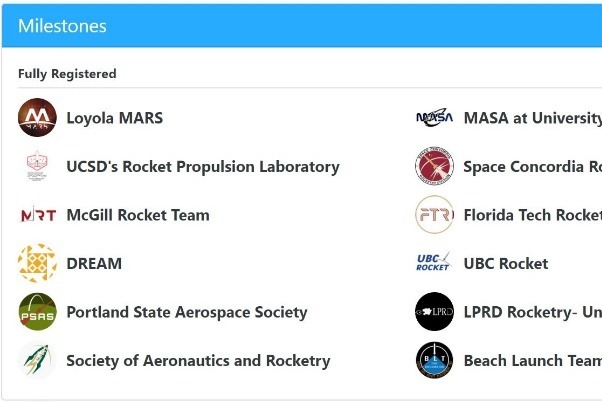 The Society of Aeronautics & Rocketry at the University of South Florida is now fully registered and a competitor in the Base 11 Space Challenge! Your contributions helped us obtain the required insurance to join this competition. We are now among giants in the game of collegiate liquid propulsion; UCSD, SDSU, Michigan and many others. The journey for us is far from over, but thanks to all of you we have made our first steps. Please continue to spread the word and share our story: A team of young, ambitious students whose unified dream of space exploration is paving the road to innovating and creating the future. And as always: The Sky Is Not The Limit! This just in . . . To offer an incentive to potential and past donors and as our token of appreciation, any donation will earn your name a spot on our rocket! The larger the donation, the larger your name will be. If you have a specific or alternate name, then feel free to add that in to the comment section when you're submitting an amount to donate. Donate to our cause, and send your name to space! We spoke to Base 11 about extending the insurance deadline. And they did, to the end of 2018. Thank you to all who have donated thus far, your support means the world to the students of SOAR. Let's keep that momentum to the very end and remember . . . The Sky Is Not The Limit!